Finding an apartment in NYC is hard. Finding a real gem with some history? Pretty much only possible if you have millions to throw down. But, it doesn’t hurt to look. So we've teamed up with our real estate BroboCops at 6sqft to round up a ton of glorious homes that had former lives as clubs, stables, places of worship, and other cool stuff that you can ogle and dream about, and hopefully someday move into (but moreso the ogle/dream thing). When the East Village was considered Kleindeutschland, Beethoven Hall used to be the Grand Prospect Hall (where all your dreams come true!) for weddings, dances, and political meetings. 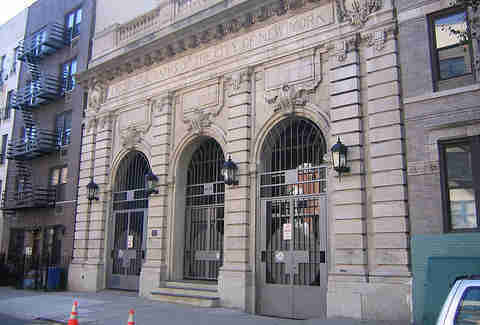 In the '80s it had a stint as the home for a film studio called Mother’s Sound Stages, but after a fire destroyed the upper half of the building, it was bought up and turned into New York Kunsthalle (“art hall”). The new hall was used to showcase the works of emerging and unknown artists and the upper floors were then converted to living and studio space for artists. 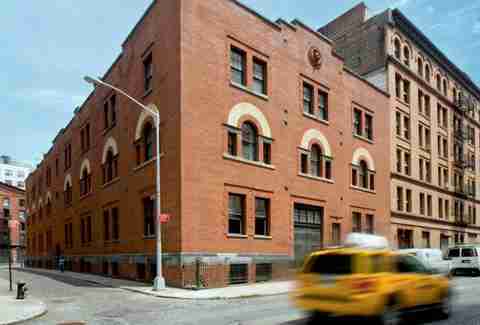 Gregory Colbert, one of the photographers living in the building, bought his 6,785sqft apartment that included Beethoven Hall in 2004 but then sold it in 2012. Advertising copywriter Tom Givone builds houses from scratch, as a hobby, and a few years ago he decided to revive this 200-year-old country home in the Catskills. 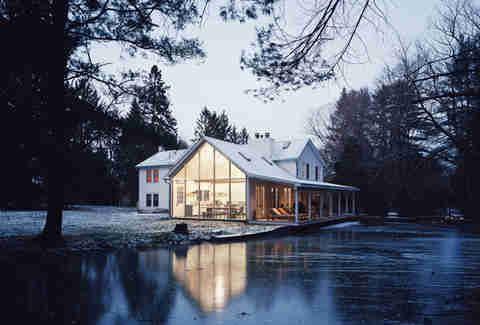 After toiling away for four years, he transformed it into his personal “floating” farmhouse. If you’ve got $600 to spare you too can spend the night there. Many of Fort Greene’s historic stables were razed to make room for commercial and residential buildings, but this beauty lucked out. 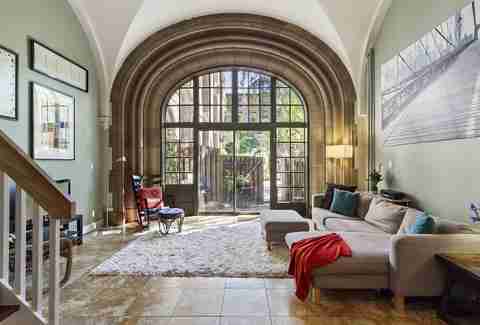 Nearly a century after its construction in 1888, this Romanesque Revival building underwent its initiation for gentrification and now serves as a one-bedroom apartment with absolutely zero hay in it. This carriage house was originally built in 1888 for American Express as a horse stable, but for the better part of the 20th century it’s been home to too-hot-for-their-time clubs and lounges like the Heat, B Square, Area, Shelter and Vinyl. And, according to Carter Horsely, a former incredibly named New York Times architecture critic, "Disco nights at Area were themed with considerable imagination and occasional vulgarity." Sounds... fun? If you ever want to save a house from being demolished, chain yourself to it and call the developers bluff, or, just tow it out of harms way with a truck. The latter is what happened to three 19th century houses back in the 1970s. Dubbed the Wilson Hunt Homes, at 37 Harrison St, the three homes are now one huge Federal-style brick house. Here’s a piece of football and religious history. This was the Cathedral College of the Immaculate Conception where Vince Lombardi used to be a student studying to be a priest (he didn’t finish there, obviously). The Gothic-style building still has its gargoyles and some pretty damn gorgeous windows. Way less holy water though. 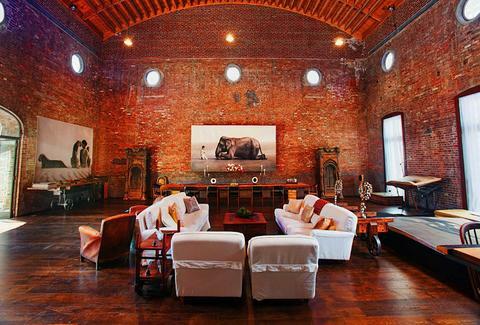 This loft has been used for so many different purposes, we’re not sure how it’s still standing (and worth $5M!). 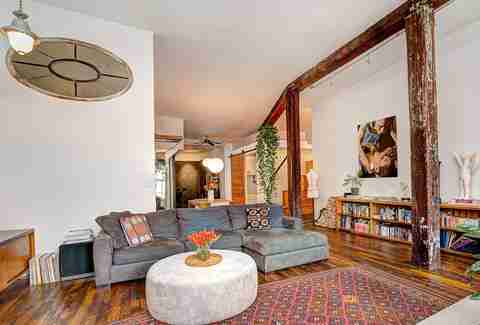 It was first built as a water tower, then was home to the NYC Fire Department Engine 256, then designated a civil defense bomb shelter, and last housed the production studio of a celebrated filmmaker for 20+ years, right before being turned into... a super-nice loft. 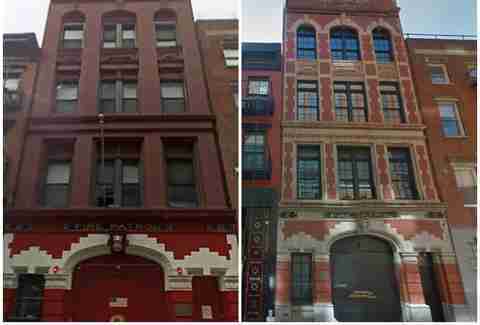 Fire Patrol Building #2 at 84 W 3rd St was built by Franklin Baylies in 1906 and is one of only three remaining fire patrol houses in the city. 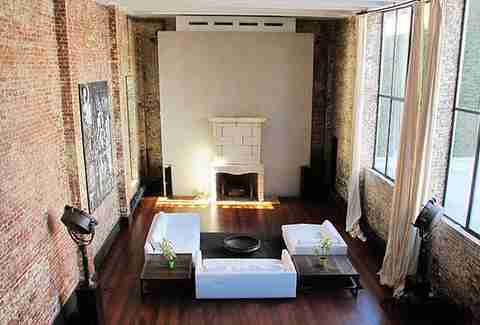 When Anderson Cooper “secretly” bought it, he stripped it bare to reveal the original 100-year-old brick work of Baylies. The inside is still a mystery to all; we wonder if he kept the spiral staircases, fire poles, and overhead beams. This schvitz was built in 1905 for the recent immigrants living without indoor plumbing facilities. Though the etching on the outside remains, this building also had lives as a wholesale grocery supply business and an illegal auto garage and chop shop. 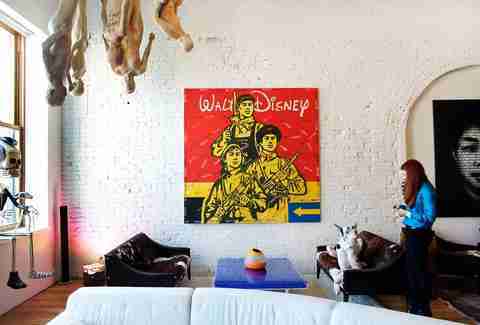 It was eventually bought up in 1995 by Pulitzer Prize-winning photographer Eddie Adams and his wife Alyssa, then turned into an enormous home and photo studio called Bathhouse Studios. Must be nice. 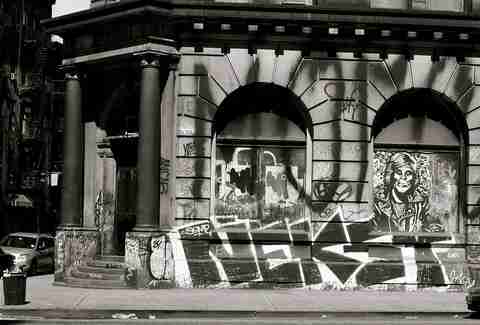 You probably recognize this graffiti-covered building. It used to be Germania Bank, and more infamously, the massive home of photographer Jay Maisel, who bought the 72-room building for himself and his family 45 years ago. Over the decades, Maisel did some renovations but some simple repairs proved to be too difficult. He ended up selling the mansion to RFR Realty, who recently decided to flip it for even more cash (it’s estimated to be worth $50 million). Last month, a new rendering emerged showing the building totally graffiti-free and luxury condo- and retail-filled. Oh-so-very New York. 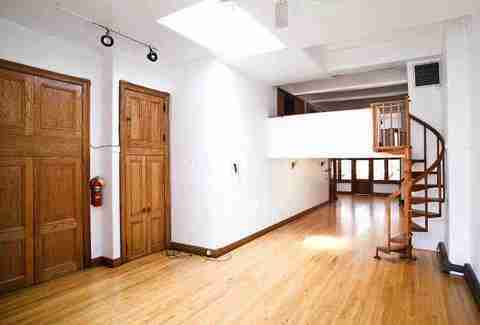 The only things still stable-like about this loft are a few original wood support columns scattered about. Though the unconventional shape of the home posed a problem when it came to light and air, MESH Architectures found a fun solution: bringing a giant, glowing cube, or “lantern”, in to ground the space. 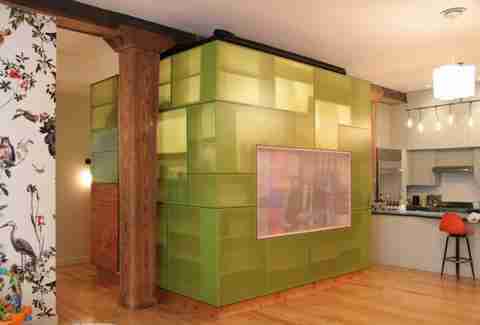 Does your apt have a glowing cube? No, it doesn’t. How would you feel living in a former place of worship? Well, if it looked like this, uh, pretty good. Before this building was converted into a five-apartment condo in the '80s, it was the Beth Hamedrash Hagadol Anshe Ungarn synagogue. Its current owners bought the building in 2007, spruced it up, and make it look, and feel, very un-shul-esque. When this former department store was turned into lofts it still had some quirky features, but Fabrica718 was still able to turn it into a spacious, yet minimalist home. Now it features renowned contemporary art collectors and their collection of art by Chinese contemporary artists. Oh so those creepy hanging mannequins are art... of course. Built in 1909 as a Con Ed switching station, 214 Lafayette is now a cool live/work environment thanks to architect Peter Guzy, of Asfour Guzy, who took on the renovation project in 2007. Its full-floor office topped by a three-floor residential apartment is owned by director Marcus Nispel of The Texas Chainsaw Massacre and Friday the 13th fame. But its stardom doesn’t stop there: the townhouse was used as the set of Queen Bey’s "Halo" music video. And you can even rent it out daily or weekly for $20,000 or $50,000.